The love for one's fellow-man as a brother. The expression is taken from the Greek word ΦιλαδελΦία("love of brothers"), which trait distinguished the early Christian communities. Rom. xii. 10; I Thess. iv. 9; John xiii. 35; I John ii. 9, iii. 12, iv. 7, v. 1; and I Peter iii. 8, v. 9 express the idea of Christian fellowship and fraternity. It originated among the Essene brotherhoods, who practised brotherly love as a special virtue (Josephus, "B. J." ii. 8, § 2; Philo, "Quod Omnis Liber Probus," § 12). Brotherly love is commanded as a universal principle in Lev. xix. 18: "Thou shalt love thy neighbor as thyself," the preceding verse containing the words: "Thou shalt not hate thy brother in thine heart." This commandment of love, with the preceding sentence, "Thou shalt not avenge nor bear any grudge against the children of thy people," may originally have referred, and has by some scholars (Stade, "Gesch. des Volkes Israel," i. 510a) been exclusively referred, to the Israelitish neighbor; but in verse 34 of the same chapter it is extended to "the stranger that dwelleth with you . . . and thou shalt love him as thyself." In Job xxxi. 13-15 it is declared unjust to wrong the servant in his cause: "Did not he that made me in the womb make him? and did not one fashion us in the womb?" The principle of brotherly love, including all men, is plainly stated in the Book of Wisdom i. 6, vii. 23, xii. 19: "Wisdom is man-loving" (ΦιλάνΘρωπον); "the righteous must be man-loving." The Testaments of the Patriarchs (Issachar v., vii.) teach the love of God and love of all men "as [His?] children." Commenting upon the command to love the neighbor (Lev. l.c.) is a discussion recorded (Sifra, Ḳedoshim, iv. ; compare Gen. R. xxiv. 5) between Akiba, who declared this verse in Leviticus to contain the great principle of the Law ("Kelal gadol ba-Torah"), and Ben Azzai, who pointed to Gen. v. 1 ("This is the book of the generations of Adam; in the day that God created man, in the likeness of God made he him"), as the verse expressing the leading principle of the Law, obviously because the first verse gives to the term "neighbor" its unmistakable meaning as including all men as being sons of Adam, made in the image of God. Tanḥuma, in Gen. R. l.c., explains it thus: "If thou despisest any man, thou despisest God who made man in His image." Hillel also took the Biblical command in this universal spirit when he responded to the heathen who requested him to tell the Law while standing before him on one foot: "What is hateful to thee, thou shalt not do unto thy neighbor. This is the whole of the Law, the rest is only commentary" (Shab. 31a). The negative form was the accepted Targum interpretation of Lev. xix. 18, known alike to the author of Tobit iv. 15 and to Philo, in the fragment preserved by Eusebius, "Preparatio Evangelica," viii. 7 (Bernays' "Gesammelte Abhandlungen," 1885, i. 274 et seq. ); to the Didache, i. 1; Didascalia or Apostolic Constitutions, i. 1, iii. 15; Clementine Homilies, ii. 6; and other ancient patristic writings (Resch, "Agrapha," pp. 95, 135, 272). That this so-called golden rule, given also in James ii. 8, was recognized by the Jews in the time of Jesus, may be learned from Mark xii. 28-34; Luke x. 25-28; Matt. vii. 12, xix. 19, xxii. 34-40; Rom. xiii. 9; and Gal. v. 14, where the Pharisaic scribe asks Jesus in the same words that were used by Akiba, "What is the great commandment of the Law?" and the answer given by Jesus declares the first and great commandment to be the love of God, and the second the love of "thy neighbor as thyself." To include all men, Hillel used the term "beriot" (creatures [compare κτίσις]; Mark xvi. 15; Rom. viii. 19) when inculcating the teaching of love: "Love the fellow-creatures" (Abot i. 12). Hatred of fellow-creatures ("sinat ha-beriyot") is similarly declared by R. Joshua b. Hananiah to be one of the threethings that drive man out of the world (Abot ii. 11; compare I John iii. 15). 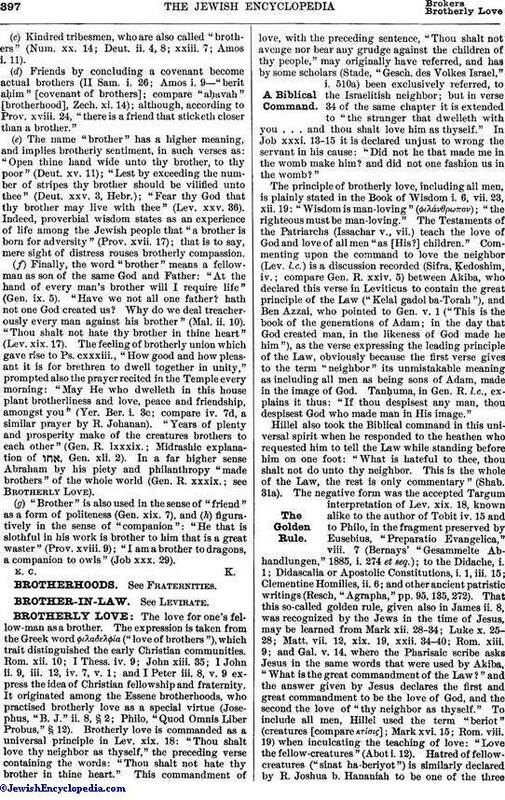 That brotherly love as a universal principle of humanity has been taught by the Jewish rabbis of old, is disputed by Christian theologians, who refer to the saying attributed to Jesus in Matt. v. 43: "Ye have heard that it was said, Thou shalt love thy neighbor and hate thine enemy, but I say unto you, Love your enemies," etc. This statement, however, lacks all foundation in Jewish literature (see Grätz, "Gesch. der Juden," iii. 312, note). Güdemann thinks that Jesus' words had a special political meaning, and that they refer to a view expressed by the zealots who wanted to exclude dissenters from the command of love by such teaching as is found in Abot R. N. xvi., ed. Schechter, p. 64: "Thou shalt not say, I love the sages but hate the disciples, or I love the students of the Law but hate the'am ha-areẓ [ignoramuses]; thou shalt love all, but hate the heretics ["minim"], the apostates, and the informers. So does the command, 'Thou shalt love thy neighbor as thyself,' refer only to those that act as one of thy people; but if they act not accordingly, thou needst not love them." Against this exclusive principle, Jesus asserted the principle of brotherly love as applied by the liberal school of Hillel to all men. Indeed, the Talmud insists, with reference to Lev. xix. 18, that even the criminal at the time of execution should be treated with tender love (Sanh. 45a). As Schechter in "J. Q. R." x. 11, shows, the expression "Ye have heard . . ." is an inexact translation of the rabbinical formula , which is only a formal logical interrogation introducing the opposite view as the only correct one: "Ye might deduce from this verse that thou shalt love thy neighbor and hate thine enemy, but I say to you the only correct interpretation is, Love all men, even thine enemies." The story of the good Samaritan, in the Pauline Gospel of Luke x. 25-37, related to illustrate the meaning of the word "neighbor," possesses a feature which puzzles the student of rabbinical lore. The kind Samaritan who comes to the rescue of the men that had fallen among the robbers, is contrasted with the unkind priest and Levite; whereas the third class of Jews—i.e., the ordinary Israelites who, as a rule, follow the Cohen and the Leviteare omitted; and therefore suspicion is aroused regarding the original form of the story. If "Samaritan" has been substituted by the anti-Judean gospel-writer for the original "Israelite," no reflection was intended by Jesus upon Jewish teaching concerning the meaning of neighbor; and the lesson implied is that he who is in need must be the object of our love. The term "neighbor" has at all times been thus understood by Jewish teachers. In Tanna debe Eliyahu R. xv. it is said: "Blessed be the Lord who is impartial toward all. He says: 'Thou shalt not defraud thy neighbor. Thy neighbor is like thy brother, and thy brother is like thy neighbor.'" Likewise in xxviii. : "Thou shalt love the Lord thy God"; that is, thou shalt make the name of God beloved to the creatures by a righteous conduct toward Gentiles as well as Jews (compare Sifre, Deut. 32). Aaron b. Abraham ibn Ḥayyim of the sixteenth century, in his commentary to Sifre, l.c. ; Ḥayyim Vital, the cabalist, in his "Sha'are Ḳedushah," i. 5; and Moses Ḥagis of the eighteenth century, in his work on the 613 commandments, while commenting on Deut. xxiii. 7, teach alike that the law of love of the neighbor includes the non-Israelite as well as the Israelite. There is nowhere a dissenting opinion expressed by Jewish writers. For modern times, see among others the conservative opinion of Plessner's religious catechism, "Dat Mosheh we-Yehudit," p. 258. 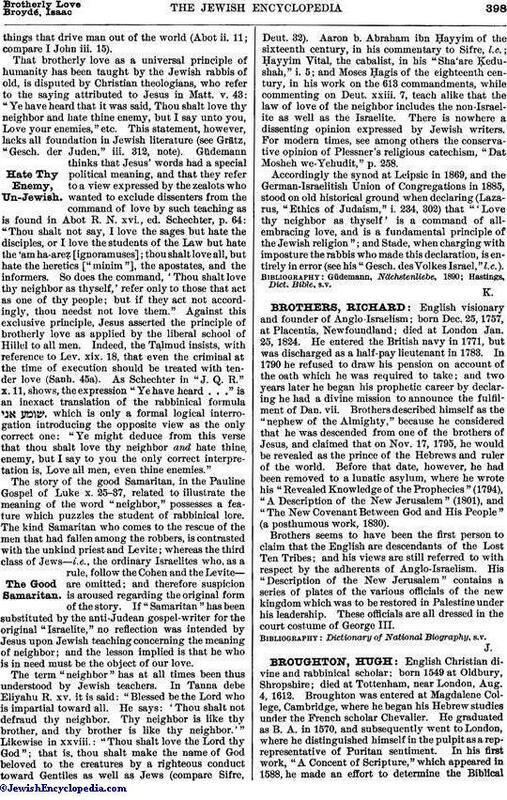 Accordingly the synod at Leipsic in 1869, and the German-Israelitish Union of Congregations in 1885, stood on old historical ground when declaring (Lazarus, "Ethics of Judaism," i. 234, 302) that "'Love thy neighbor as thyself' is a command of all-embracing love, and is a fundamental principle of the Jewish religion"; and Stade, when charging with imposture the rabbis who made this declaration, is entirely in error (see his "Gesch. des Volkes Israel," l.c. ).